Facebook is expanding its Facebook Gifts program with the announcement of additional partners to the program. Today, Facebook announced that it was making iTunes available for gifting Facebook friends with music, movies, games, and apps. Facebook Gifts isn’t available to all users yet, but it’s steadily being rolled out throughout the United States. Just a couple of weeks ago Facebook held a press conference at FAO Schwartz to announce that the social network had partnered with Baby Gap, Fab, Brookstone, Dean & Deluca, L’Occitane, Lindt, ProFlowers, Random House, Inc., and NARS Cosmetics. During the same press event, Facebook revealed that it had opened up Facebook Gifts to 10 million more people in the U.S. This is however just a sliver of the 1.1 billion total global users and the 168 million users in the United States alone, however, so there’s plenty more growing to do with this product. But remember, Facebook Gifts isn’t just about giving to your Facebook friends. Just after Hurricane Sandy, which postponed the Facebook Gifts announcement set for October but was rescheduled to this month, Facebook announced its partnerships with 11 charities including the American Red Cross, Kiva, Charity Water, and others. Users are able to make charitable donations to these organizations directly through the Facebook Gifts feature. As for sending friends an iTunes gift, users are now able to scroll and search through the in-Facebook module that opens up the iTunes store inside of Facebook Gifts. Gifting a digital good is the same as gifting a physical product from any other retailer so if you’re a user already there won’t be any features changes you need to worry yourself with. The only difference is that when you make a purchase, you’re essentially giving someone a gift card. The recipient has the final say on what they’d like to receive. Facebook does have access to a treasure trove of data about each user’s interests through the Open Graph, which could play into Gifts recommendations. The social network, if users log onto third-party entertainment sites like Netflix, Hulu, Spotify, and others using Facebook Connect, knows exactly what we’re listening to, playing, and watching. There’s almost an expectation that Facebook will expand Facebook Gifts to account for the data it already has access to, to better help with users with recommending gifts for a friend’s Birthday. 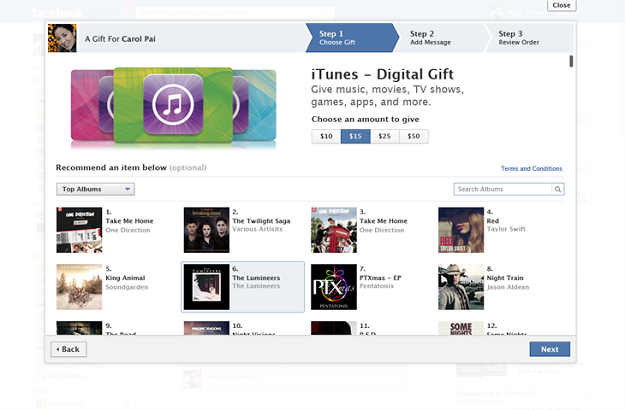 According to Facebook, the digital iTunes gifts will be made available for $10, $15, $25, or $50.